Manufacturer of a wide range of products which include stainless steel screw. We are exclusively occupied with our proficiency in offering a wide variety of Metal Screw. This metal screw is manufactured utilizing supreme class raw material and modern techniques following the set norms of market. 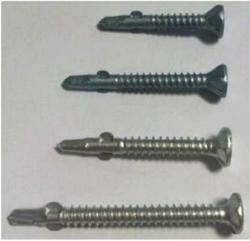 The offered metal screw is available in varied specifications and can also be customized as per the needs of clients. Our metal screw can drill and countersink onto Smart Ply. Looking for Metal Screw ?